I have struggled with so many emotions as I have tried to write this post. I really want to express my appreciation of this incredible man. I feel so lucky to have been blessed by his council and leadership. I have felt his amazing spirit when in a large auditorium with him, as well as when he has visited our ward. It is beyond explanation, but honestly I felt the spirit change when he came into the room; and I will never forget that feeling. Even as I think about it now, I know that he was a prophet of God; and as such radiated His divine love for each of us. 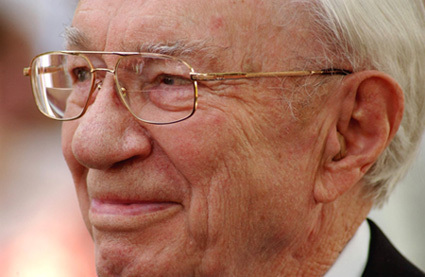 At 97, President Hinckley certainly led a full life and I can’t help but think that he is excited to be with his beloved wife again. Last night as I lay in bed, I thought about his life and all of the amazing growth the church has had under him. I wondered about his family and I hope that they are comforted; then I had a thought of what a celebration there must be in heaven right now. How much joy they must feel to have such a valiant spirit home with them again. I am so grateful for the time that we had him here and for the legacy of faith and love and the teachings that he has left us. Thank you President Hinckley; I will miss you!